This rules out a deluxe war. This unavoidably costs lives and we’d be exceedingly lucky to even limit the cost. This is why Binyamin Netanyahu and Moshe Ya’alon were so reluctant to begin a land incursion. They did so only after several Hamas attempts to infiltrate kibbutzim and spill blood there – after the tunnel hazard could no longer be deferred for a future showdown. It was Hamas that forced Israel’s hand. After Iron Dome had thwarted Hamas’s plans to pulverize Israel’s densest population centers, it resorted to its other major weapon – the tunnels. Israel had known about their labyrinthine extensions (Gilad Schalit’s abduction in 2006 was facilitated by one) but there was no quick painless remedy. It’s easy to carp about nothing having been done for years but we can only imagine the uproar that would have been generated – both domestically and internationally – had the IDF reentered Gaza with no palpable pressing provocation. Disengagement is the original sin which enabled Hamas to invest all of Gaza’s resources in these fortified subterranean mazes. Once the Philadelphi corridor was relinquished, its few smuggling tunnels burgeoned unhindered into massive networks. The short stint of the Muslim Brotherhood at Egypt’s helm boosted the tunnel construction monstrously. Hezbollah engineers and supplies flowed in unobstructed and Qatar footed the bills. Hamas simultaneously enjoyed sustenance from Iran, ostensibly at cross-purposes to Qatar. Hamas was spoiled for choice until Mohamed Morsi was deposed. And all the while, Hamas nurtured the pretense of a humanitarian crisis in Gaza. There was piteous wailing about the lack of cash and even of cement to construct housing and rebuild what was destroyed in clashes with Israel. The pressure to “break the blockade” on Gaza was fierce. Israel was even coerced to ease its ban on cement and building materials for Gaza. We now see what all that was used for. We also know where the colossal contributions solicited internationally were sunk. They all went to construct an underground tangle of tunnels intended only for murder and abduction. It’s time for the foreign donors and governments, for international organizations from the UN to biased NGOs – for all those who amplified Gaza’s pretended plight – to beat their breasts in contrition. In the end they contributed to today’s Gazan disaster. It was homemade but avidly abetted from abroad. Netanyahu inherited this fait accompli in 2009, by which time no facile fix was possible. He was justifiably not trigger-happy. He sent troops in only when no other alternative existed. Foreign statesmen and opinion molders need grasp that this wasn’t a decision taken lightly by an adventurer. At home all those who went along with Disengagement owe us to tone down their criticism. Contrary to their rosy predictions, Gaza squandered its opportunity for independence and prosperity. It propelled Hamas to power, brazenly choosing belligerence over coexistence. Those who disseminated these predictions are the very ones who’d have raged against the notion of invading Gaza and they are the very ones who just recently began campaigning for negotiations with Hamas – on the grounds that ISIS is worse. But in reality Hamas is as bad as it gets. Israel’s task now is to expose and destroy every tunnel it can – along with the buildings atop all points of origin. Beyond that – no matter how shrilly the world protests – we must rethink our policies regarding what materials we allow into Gaza and whether we should continue to supply electricity to its tunnel constructors and rocket manufacturers. The infrastructure of the Gaza terrorists must be destroyed. The model of a “Palestinian” state is Gazas underground terror entity, so much about Kerrys and Obamas FAILED “two state” solution. Pour liquid Chlorine in the open end of the tunnel and then Muriatic acid and get away. the gas created is heavier than air and will stay in the tunnel. Cheaper than explosives. “The world” continues, as usual, to accuse Israel of genocide and other crimes against humanity, just for defending herself and her citizens. Some Jews, however, out of the very same malice, or delusion, or confusion, are doing likewise, sad to say. 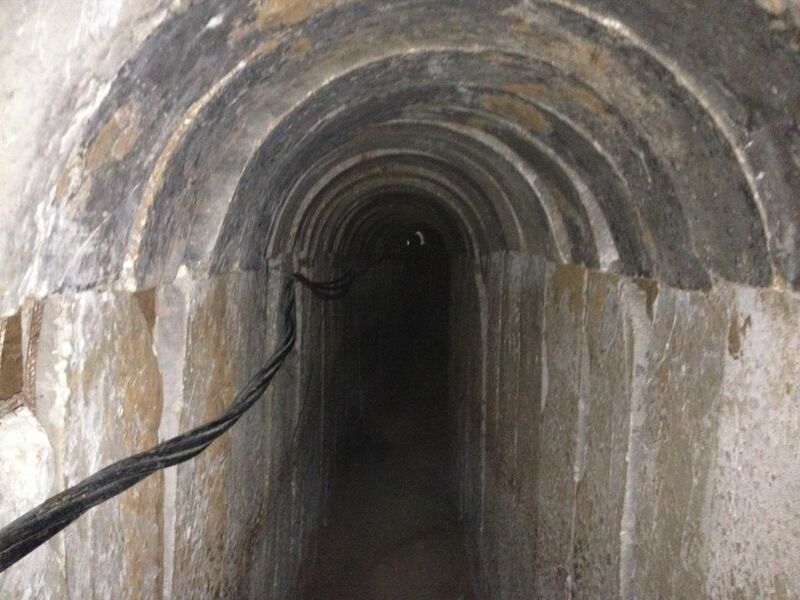 Time for Israels IAF and IDF to complete the job of ‘destroying the underground maze of tunnel networks’ in Gaza. Israel completed the job of destroying the nuclear facilities at Osirak in Iraq in 1981, (the world press and ‘international leadership’ virtually went out of their minds condeming Israels IAF military operations) BUT, the results were fantastically successful and who gained the benefits? Of course, the naysayers at that time. NOW, its time for Israel and its leadership to tell all of the socalled ‘international community and the US’ to ‘f—off’ and let the Israelis ‘finish the job of destroying hamas and its ‘world of tunnel mazes’. Check out how the US and it’s allies won WW2…Blanket bombing, atom bombs on Hiroshima and Nagasaki… killed millions to stop the axis once and for all! and the world became a better place to live in. Now the Muslims are trying to ‘rekindle’ death and destruction to the Jews and ultimately the ‘big banana, the US’, to install their califate and sharia laws to destroy the rest of the ‘freedoms; remaining in the free world. Support Israel, one of the only ‘sane nations’ remaining in the world…to, once again, save ‘the future of ‘peace and freedom! the tunnel network, extremely difficult and hazardous as it is, might have become insuperable. to a “cease-fire” and so, come away victoriously. Israel must stand firm and reject the U.S. pressure until the mission has been completed. losses, already suffered by the IDF, will likely have been in vain. early on, when it was still possible, to save the now 160,000 civilian deaths in Syria? Gaza is Israel’s problem. Why? Yes, why? In the 1979 peace treaty Begin agreed to give up all the land while keeping all the Arabs. Israel’s answer is, blame the Begin. Yes, people can be stupid. Sinai was empty; Gaza was full – of enemies. Sadat won. Carter won. Israel lost. But this is just what happens when you trust one person to make all the important foreign policy decisions. Instead, there should be referendums, always, and NOT just yes or no. Multiple solutions with multiple run-offs. The future of the Jewish people should NEVER be placed in one fallible pair of hands. Yes, the mass of people can make mistakes too – but at least there can’t be the usual, “blame, wash hands, and repeat”. You’d have to reflect. Pharaonic rule is for our enemies. Make impossible for us, Israel!